This story was updated at 10:27 a.m. EDT. The lastthing one usually wants on a spaceflight is a crash, but that's exactly whatNASA is hoping for when it launches two new probes at the moon?s south polethis week on the first U.S. lunar mission in more than decade. The twoprobes will tag along with powerful newlunar orbiter that will map the moon's surface to help figure out whereastronauts might set up moon bases in the future. 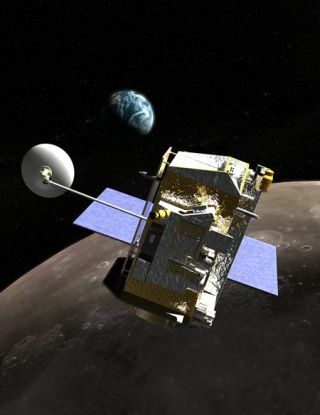 "We'venever had a mission where two spacecraft go to the moon at the same time before- it's very exciting, the first time we've tried anything like this since theApollo missions," said Anthony Colaprete, principal investigator on NASA'sLunar Crater Observation and Sensing Satellite (LCROSS)mission. NASA plansto launch LCROSS and its partner orbiter atop an unmanned Atlas 5 rocket asearly as Thursday afternoon at 5:12 p.m. EDT (2112 GMT), one day later than planned, from the CapeCanaveral Air Force Station in Florida. The $580 million joint moon mission,NASA?s first since 1998, was delayed to allow a Wednesday launch for the spaceshuttle Endeavour after a gas leak thwarted an earlier attempt. The LunarReconnaissance Orbiter (LRO), LCROSS? moon-bound partner craft, will map themoon's surface from orbit with unprecedented detail, capable even of imagingthe tracks that lunar rovers left behind. Its high-resolution camera can imagethe moon to about 12 inch detail (30 cm), "which no one has everhad," Colaprete said. The best resolution until now from lunar orbit wasroughly 20 meters. The kind ofimages LRO will gather are needed for safe, highly precise moon landings atmore hazardous places than astronauts ever went to with the Apollomissions. The data it collects on radiation and lunar chemistry could alsoinfluence the design of potential settlements. The probe will circle the moonin an orbit over both poles for a year, and its mission could get extended upto five years to serve as a communications relay for future lunar missions,such as a moon lander or rover. Riding alongsidethe orbiter is LCROSS. This hitchhiker mission isdesigned to bite into Shackleton Crater, or other crater, on the south pole ofthe moon twice, with the main impact packing a punch equal to more than aton-and-a-half of TNT. The impactor?s final target depends on when it actuallylaunches toward the moon, mission managers said Monday. LCROSSis not the first mission to crash into the moon. Last week, Japan?s Kaguyalunar orbiter was intentionally commanded to slam into the lunar surface at theend of a successful observationmission. China?s Chang?e 1 orbiter also ended its mission with a lunarcrash earlier this year. ?Impactingthe moon to do science ? has gone on since before I was born, frankly,? DanielAndrews, NASA?s LCROSS project manager, told reporters in a Monday briefing. ?What?s different as LCROSS is that it is tactically employed as an impactor.So everything we do with our mission design is designed around maximizing thevalue of our impact.? Pastmissions have revealed the poles are rich in hydrogen - a possible sign ofwater - and by looking at the aftermath of the lunar double whammy, scientistshope to confirm once and for all whether ice exists on the moon. The moon'spoles are mysteries in many ways ?- "we have much better maps of Mars thanof our own moon's polar regions," said Craig Tooley, NASA?s LRO projectmanager. Instead ofarriving at the moon in a few days like LRO will, LCROSS will orbit Earth twicefor about 110 days, using Earth's gravity help sling it on a collisioncourse with the lunar south pole in early October. This smaller,bare-bones probe has two main parts - the roughly 6-foot-wide (2 meter) Centaurrocket stage used to boost it to the moon, and a shepherding spacecraft thatwill accurately guide the Centaur at the crater and then separate. Whenthe rocket stage, which at 5,100 lbs. (2,300 kg) has roughly the mass of a big sportsutility vehicle, slams into the lunar surface at a steep 85 degree angle, itwill be hurtling through space at about ?5,590 mph (nearly 9,000 kph). Althoughthere is a fair amount of uncertainty as to exactly how big an effect thisimpact will have, Colaprete estimated it will toss up roughly 770 million pounds (350,000 metrictons) of debris into the sunlight, carving a crater about 12 feet deep (4meters) and 80 feet wide (25 meters). Impacts ofsimilar size happen roughly three or four times a week on the moon. "We'regoing to lift matter up from the crater that could have been in shadow for 2billion years," Colaprete said. "For the first time, we'll see whatit is composed of, what secrets it is guarding." Theshepherding spacecraft will watch the plume of gas and dust rise about 3.7miles high (6 km), "shaped kind of like an upside-down lampshade,"Colaprete said. Matter could even be knocked up 30 miles (50 km) or more, headded, and the flash might be visible through amateur-class telescopes withapertures as small as 10 to 12 inches. Theshepherding spacecraft will then fly through the plume the Centaur kicks up,using its five cameras and three spectrometers working in the visible,near-infrared, and mid-infrared wavelengths to scan for water or othercompounds. An onboard photometer will also very quickly and precisely measurethe faint flash of the impact itself, which in a few hundred milliseconds can revealhow far the rocket penetrated, how strong the lunar matter was, and even ifwater escaped. Then,about four minutesafter the Centaur's impact, the shepherding spacecraft will itself crash at adifferent spot about 2 miles (3 km) away to offer a second chance to study thesouth pole. Both impacts will be monitored by spacecraft such as the newlyrepaired and improved Hubble Space Telescope, the European Odin satellite and India?sChandrayaan-1 probe, as well as Earth-based observatories at Hawaii, California,New Mexico, Arizona, Korea and South Africa. "We'regoing to be able to address some fundamental questions about the moon,"Colaprete said.